Rope and Sling Specialists Ltd. (RSS) has named lifting industry veteran Davey Walker business development director (Scotland), effective today (20 August 2018). Based at the company’s Grangemouth site, he brings 44 years of experience to the role, most recently from leadership positions at Speedy Lifting and its acquired business Lloyds British Testing. Walker has already initiated a two-pronged offensive to grow business at the northernmost of RSS’s six UK sites and continue to serve as a bastion for lifting equipment specialists. He is well placed to deliver on both fronts having successfully led half-a-dozen Scottish facilities for the last 15 years before accepting the new position. 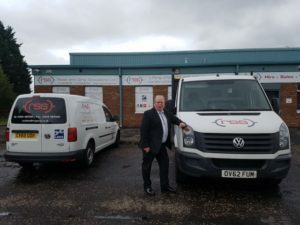 In the first instance, Walker will look to leverage a vast contacts book to cultivate potential customers in the Stirlingshire vicinity and further afield, whilst looking for ways to better serve a diverse, existing customer base. It is anticipated that he will setup meetings with purchasing decision makers in the region’s refineries, where lifting and rigging gear of all types and capacity is in widespread use in one of the country’s most demanding end user marketplaces. Key to success, and the other side of Walker’s bifocal approach, is the company’s status as a specialist supplier of lifting and rigging equipment, as opposed to a diversified rental business or a tool hire firm that has expanded into the sector. He has been resolute in upholding certain values and standards to this end over more than four decades, and is confident that he is among kindred spirits at his new company.